We are truly excited to announce that the ultimate cross-platform development toolset now sports even more features and stability updates. This new service pack update includes a new localizable business template, over 50+ item templates for Visual Studio, dynamic localization service, new template definitions for iOS, major stability updates for Android, support for application-wide single sign-on, and much more. 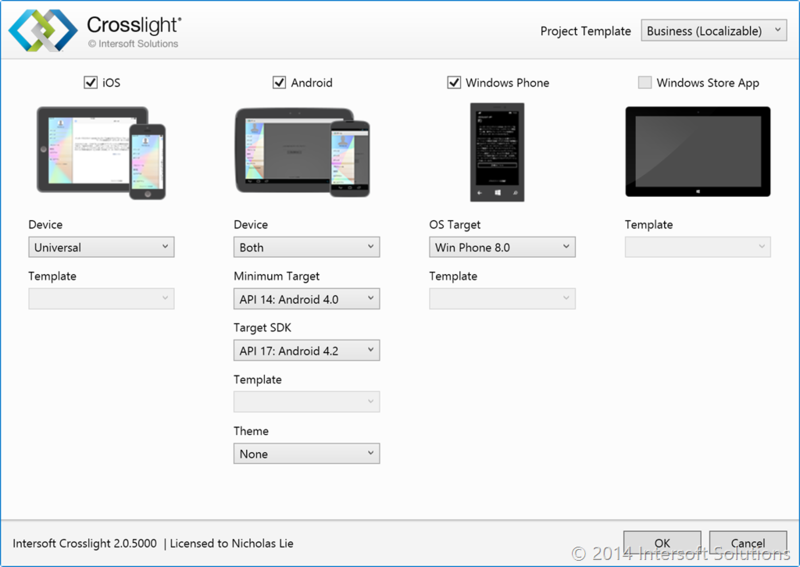 The Crosslight Project Wizard now includes an additional and noteworthy template, which is the localizable business template. The new localizable business template allows you to change the language of the application dynamically at runtime, thanks to the dynamic localization service. If automatic language is set, when the device’s language is set to the one supported by the application, then the language changes automatically. However, you can also force an application to use a specific language of your choice, regardless of the language setting used by the device. 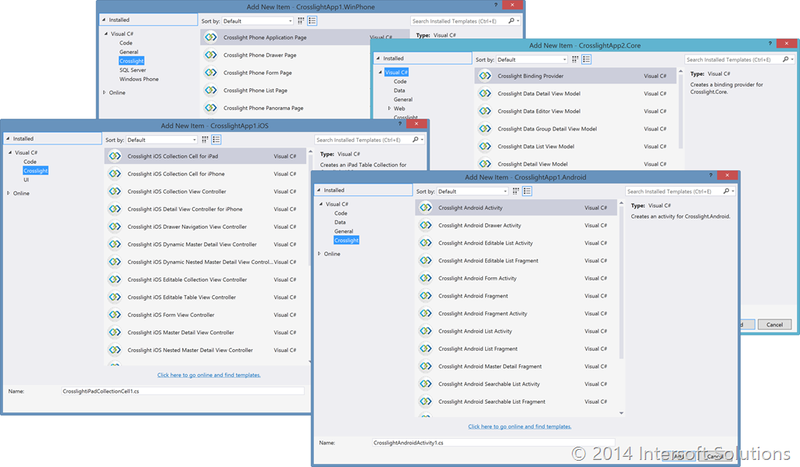 The following screenshots show the improved Crosslight Project Wizard and the running app respectively. We have also shipped more than 50 templates for Visual Studio, ranging for variety of projects, this includes, Android, iOS, Windows Phone, and shared Core project. The templates itself is clear and concise, with instructions inside each template on how to use it. Your development process will be significantly accelerated since you can now quickly add common Crosslight items to your project. 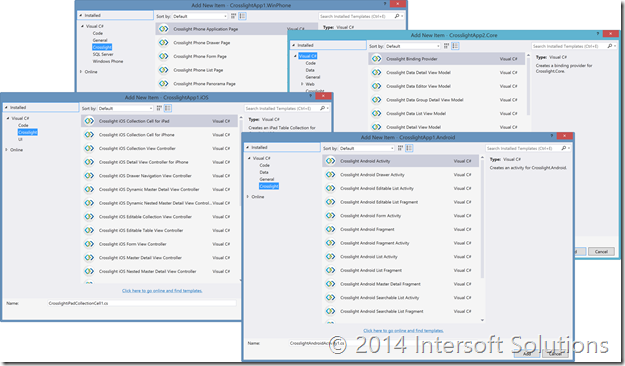 Say goodbye to the tedious, error-prone copy and paste. 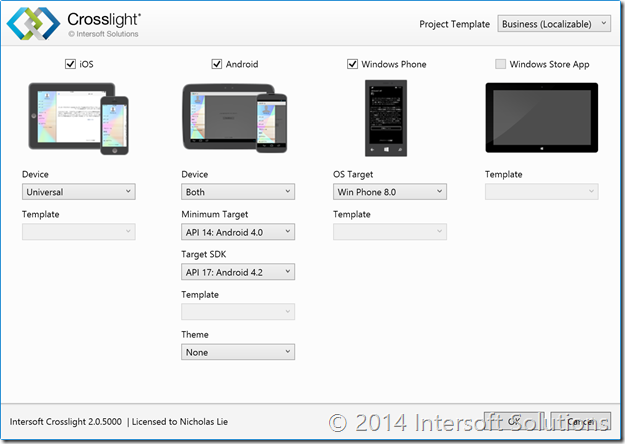 In addition, Crosslight for Android platform has received major stability improvements, including the support of Xamarin.Android.Support.v4 library, revamped overall lifecycle, elegant rotation handling to ensure that view state is restored without performance degradation, improved tab caching, and reliability of the Android services, such as camera service, location service, social services, and more. 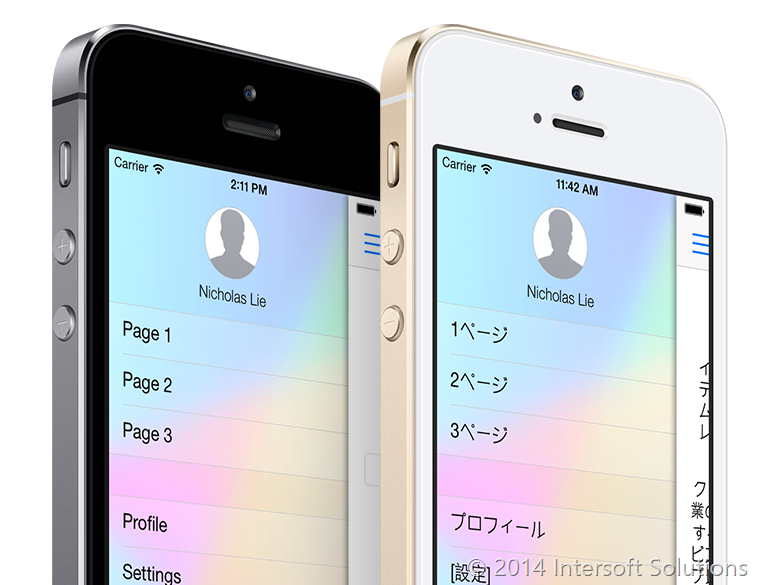 So far, we’ve only touched the surface of what’s revamped in this SP1 release. For a complete list of the updates, make sure you check out the Crosslight 2.3 release notes in our Developer Center page. All the installers on our site have also been updated to reflect the new bits. Of course, this update is free of charge for customers with existing subscription for Mobile Studio or Premier Studio. Click here to sign in and access your downloads. If you haven’t tried Crosslight today, request a trial now and see how Crosslight transform the way you build cross-platform apps entirely. Last but not last, we hope you enjoy Crosslight as much as we love building it! Stay tuned for our upcoming video tutorials and hands-on guide to apply these exciting features in your apps!